At first glance, a boxelder tree looks like poison ivy grown into horrifyingly large proportions. 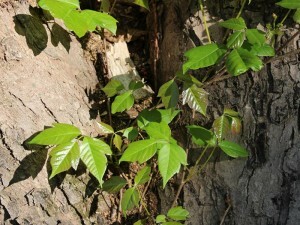 The leaves resemble each other very closely, particularly when both are young. 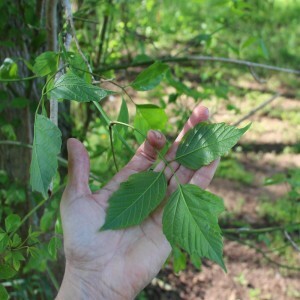 One way to tell them apart, however, is the boxelder has opposite leaves while poison ivy has alternate leaves – but you have to look down the stem to notice this as the two photos below show nearly identical arrangements. Both are native to Virginia, so they each have benefits to the environment. 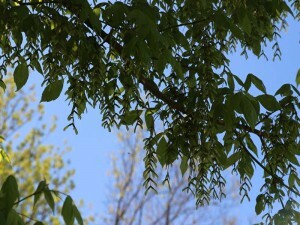 At this time, White House Natives is not growing poison ivy so we will focus on the boxelder tree, Acer negundo. They are of small to medium stature, growing 30-60 feet in height and 1-2 ½ feet in diameter, commonly seen in river bottoms in sandy loam soils but they can also be happy on slopes with poorer soils. 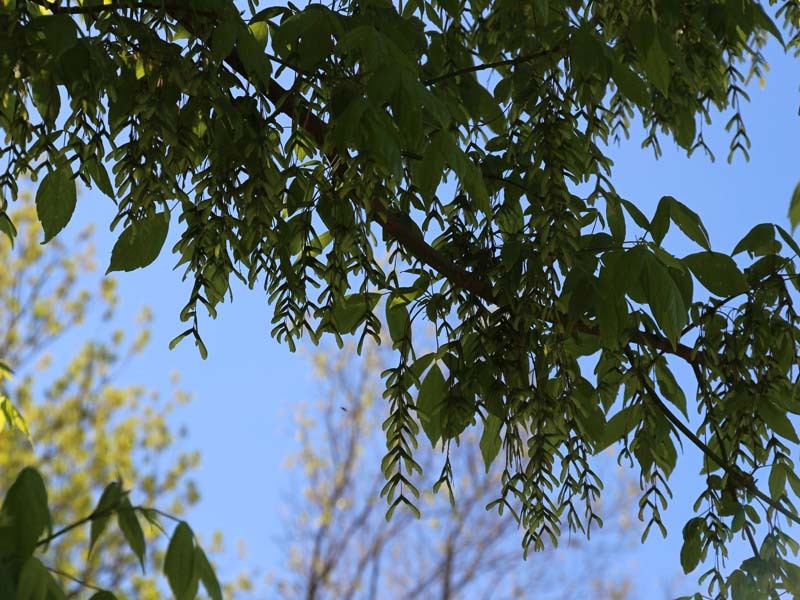 One surprise about the boxelder is it is actually part of the maple family so its seeds resemble little helicopters as they flutter to the ground like those of the red maple, silver maple, sugar maple, etc. Squirrels consume the seeds as do several bird species. There are 128 species of maple worldwide with 13 native to North America. Acer negundo is the only North American maple with compound leaves and these grow as three to seven leaflets. The common name comes from the white wood which resembles that of boxwood and the pinnately compound leaves similar in appearance to those of elderberry. It is also commonly known as ash maple, river maple, boxelder maple, maple ash and other such derivatives of the name. 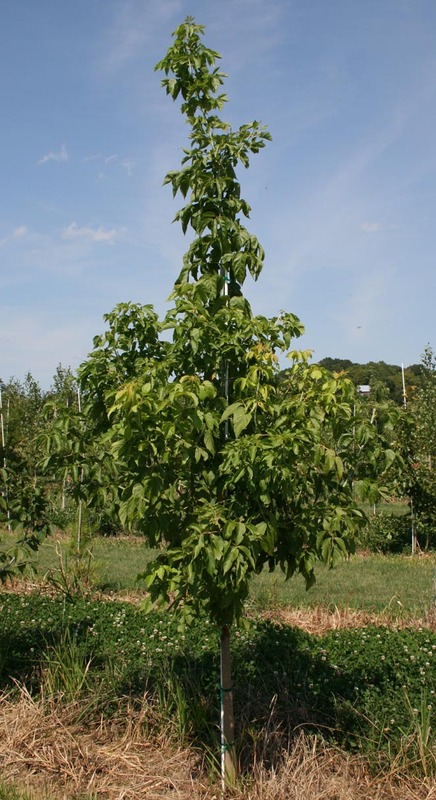 Unlike most other maples, A. negundo is dioecious as both a ‘female’ and ‘male’ tree are needed for reproduction. It is fairly quick growing with a maximum average height of about 60-80 feet and a trunk diameter of 12-20 inches. It often has multiple trunks and appreciates full sun. The branches tend to break easily so, if planted as a quick shade tree, it should be in a location where maintenance won’t be a major factor.